I wrote in July about how cloud computing isn’t the same for every enterprise, and the true implications of this have been becoming clearer to many over the last several months. VMware’s vCloud Hybrid Service, in particular, offers a view of an entirely different cloud story targeted at a largely different buyer audience than the likes of Amazon, Microsoft or Google. What VMware’s story most demonstrates to me is the one question that matters more than any other when it comes to cloud buying patterns: To what extent does a company engage in software development to define its business? The answer to this question will determine the mix of technologies and services that company will demand — at least for the next few years. Before I explain, let me first ask a key question to people marketing cloud products and services. It’s pretty simple, actually: Who are your buyers, and how are they buying? When it comes to so-called enterprise IT, I would argue there are actually two key buyers these days: traditional IT operations, and “the business,” which includes software developers building applications to enhance the business (or even be the business). These two buyers act differently, and they want to buy different things. The cloud success stories that have been trumpeted most loudly to date have largely been from the software developer perspective. Netflix, Etsy, Amazon itself — even GE’s move to cloud models — are largely stories of enabling online commerce, data analysis and media application developers to reach incredible agility at scale. In these cases, the IT technology and service buyers are often the developers themselves, or the owners of the applications being developed (e.g., a business unit or a project owner). Very rarely is procurement of developer-centric cloud services outsourced to a central IT operations team. That would just be adding a middleman to the process, thus decreasing agility. There is, however, another angle to cloud: organizations seeking to get IT infrastructure faster and more efficiently for a variety of computing and data-storage purposes. Running software developed by a third party is still huge business, and new analytics tools are creating the need for computing capacity at scales never considered before, even within a private data center. These organizations don’t generally need thousands of servers for a single application, but might instead need tens of servers for each of hundreds of applications. For most of these organizations, software development scale and agility take a back seat to operational agility needs, which are often quite different. The tools, methods, skills and services any given business (or business unit) will require for IT will vary greatly based on whether or not innovation through software is key to the organization’s success. 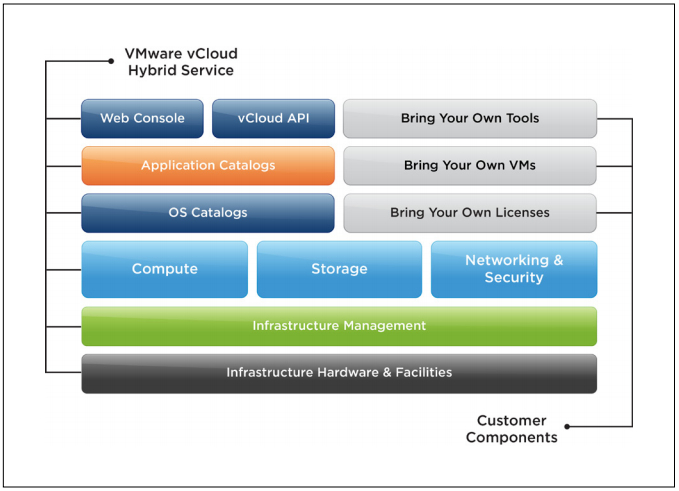 This is where VMware’s vCloud Suite and vCloud Hybrid Services come into the picture. Although VMware’s offerings are fairly criticized as being less optimal for the types of large-scale application development and operations that sing on an AWS-style cloud, they hit the sweet spot of those organizations that are more focused on infrastructure. It is an extension of what they already know and love about virtualization, and they can see value of adding self-service for specific IT services on top of that virtualization. Furthermore, by creating a tightly controlled technical ecosystem, VMware will be better able to assure consistency in operations across the vCHS ecosystem. Assuming VMware can execute on its stated strategy, it will create increased confidence among IT operations staff that strategies and tactics defined around VMware technology will work, regardless which vCHS cloud provider is chosen. In the long term, however, I think its pretty clear that the market will move away from infrastructure-centric IT, and become more and more focused on applications. The packaged application market has already been seriously disrupted by software-as-a-service models. There is increased demand for custom internet services, even in industries that traditionally haven’t used software to sell or support their products and services. Also, the so-called “internet of things” is creating new demand for integration between devices, software systems and diverse data sets. The result of this will be, in my opinion, a steady move away from infrastructure-centric buying to much more application-centric buying, with the exception of cloud providers themselves and a few companies with big enough IT needs that they can justify running their own cloud services at scale. Yes, smaller private clouds and even dedicated systems for legacy applications will continue to exist and provide a niche market, but the majority of buying will shift to applications and services. As this shift happens, the VMware story will have to evolve with it. The very fact that many companies will have both infrastructure- and application-centric IT processes working in parallel means the majority of the market will be buying from both the VMware and Amazon models of cloud technologies. This creates both opportunity and challenges for enterprise IT departments, as they must successfully meet two sets of demands while still meeting such mandates as compliance, security and the maintenance of staff skills to meet these demands. Others are affected by this shift, as well. Hosting companies are already faced with a giant shift in strategy. This is why managed hosting has been making a major comeback, and why many large hosting companies are on their second or even third generation of cloud infrastructure offerings. They are, if you look closely, becoming more application-aware with each iteration. Interestingly enough, I think Microsoft is a company well prepared to be disrupted by the move from infrastructure to application centricity. The Azure alignment with Windows Server and Systems Center has always been a key part of its cloud strategy. Add the fact that Azure is one of the “big three” new model cloud providers (with Amazon and Google), and you have an interesting route for Microsoft customers to transition from focusing on infrastructure to focusing on applications. However, no company is immune from needing to understand the effects of cloud on software development and application-centric IT on current and future buying patterns for their customers. We are all adapting to a changing environment, and there will be winners and losers. Luckily, evolution takes time, and we can all understand these changing buying patterns and adapt to take advantage of them — both as buyers and sellers ourselves. Thoughts? Do you disagree that the degree to which software development is strategic to a business defines cloud buying patterns? Comment below or reach out to me on Twitter at @jamesurquhart. James Urquhart is director of cloud management products at Dell. I like your point of separating strategic software from off-the-shelf software. I think of it this way; in a hundred years (figuratively speaking) most applications are likely be delivered as multi-tenant services (I guess we all agree on that it will happen, the debate is how fast it will happen), with the exception of internally developed secret-sauce software (i.e. companies pursuing strategic software development, as you mention). The funny part is that the software vendors (the developers of the off-the-shelf software) are actually also pursuing strategic software development, as creating software is their job and their unique product holds their value. So it boils down to two groups of software developers â€“ the companies developing of â€œprivate softwareâ€ (that wonâ€™t be shared with others) and the software vendors who provide SaaS to the rest. And there will be many of those SaaS vendors. I mean, just because everything becomes SaaS doesnâ€™t mean there will be just a handful of CRM systems â€“ there are thousand providers of CRM today and in my opinion there will be many more in the future (itâ€™s easier and cheaper to develop and distribute software today than yesterday, making it feasible to create more niched software to target particular sub-segments etc.). Tough to disagree with much here although I would argue that privacy and control will still put the long-term focus (and burden) on infrastructure-centric IT, not public cloud applications and services. Amazon is well ahead of everyone on the full range of cloud products they offer. Their core compute and storage features are very mature and so all the extra features like RDS, DynamoDB, Route53, Cloudfront, Mail Delivery, etc all support this. It’s about providing the core infrastructure and then all the supporting services that applications need. Rackspace are following a similar strategy with the additional services they’re now offering as their core compute/storage services mature, but are pretty far behind compared to Amazon. VMWare do actually have quite a few software products to support applications, they’re just not as tightly integrated into their infrastructure services (if at all). With the vCloud Hybrid we’re starting to see this as a direction but it’s coming from a big enterprise company with a lot of legacy. I wonder if this is the start of their transition to a more SaaSy model, even if it is still with packaged applications customers run their own facilities. Maybe VMWare will be the enterprise private cloud vendor of choice? Great stuff James. I do indeed agree with you. Any wannabe cloud infrastructure provider needs to understand first who the real buyers are. and, the 5 year old translation for us newbies ……. ? there are as many types of Clouds as there are clouds, pick wisely? know the structure of the Cloud to maximize its potential for desired results? ramification on say civic needs of city corporations and integration over inter-governmental realities.